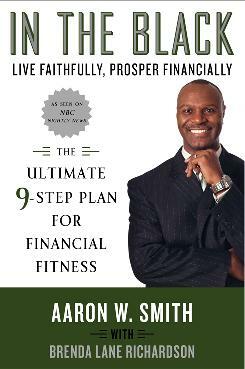 With economic uncertainty reaching unprecedented levels, Aaron W. Smith's nine-step plan is designed to help African Americans take control of their financial futures, emphasizing the importance of saving, budgeting, investing in retirement plans and risk management. According to Publishers Weekly, "Smith shares uplifting case studies of clients and public figures, ranging from the wealthy and successful (e.g., Supreme Court Justice Clarence Thomas, a multimillionaire couple, a single mother and successful entrepreneur) to those struggling to find their financial footing (e.g., one man fighting to rebuild his life post-incarceration and another who successfully overcame the addictions that had destroyed his family life and left him destitute)." "In the Black," which is not shy to refer to spirituality and matriarch Aunt WaWa's advice, provides guidance that can be used across a broad spectrum of age groups—for those who are just starting out and those who find themselves in midlife with concerns about your retirement, for instance. The guide book offers concrete advice on what opportunities are available and using real-life examples to illustrate how anyone can achieve their financial dreams be they middle- aged and facing debt or actively saving since their early twenties.